Around the Spiral with Edward Lifegem: Mechanical Owl Pets Are Now In Pirate101 Crowns Shop! 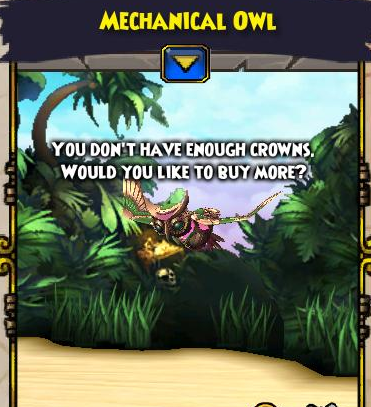 Mechanical Owl Pets Are Now In Pirate101 Crowns Shop! There's a new epic pet in the crowns shop! The Mechanical Owl pet can be bought with 2,500 crowns in the Pirate101 Crowns shop today. :D This pet is so cool, I know I will be getting one for my swashbuckler once I get crowns. Click on that :D reaction below if you think this is an awesome addition to Pirate101. Thank you for reading this short little blog post. I hope you enjoy your new pet if you do decide to buy one! If you don't have enough crowns at the moment (like me) to buy one of those pets, you can buy crowns on the Pirate101 website by clicking on the image attached. If you want to earn crowns, visit the Kingsisle Free Games website and earn 100 crowns a day by playing Pirate101 Trivia (there's also other Trivia on this site) and earn those crowns to buy yourself one of these awesome pets. Add the math, 100 x 25= 2,500 which means in less than a month you could buy yourself one of these pets if you earn the crowns. If you would like more information about that, just click HERE.